Springer Nature’s “Corporate Sustainability, Social Responsibility and Environmental Management” was one of the top 25% most downloaded eBooks in 2017. 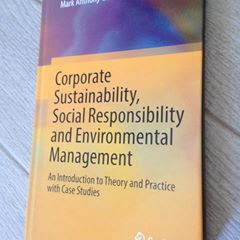 This publication provides a concise and authoritative guide on corporate social responsibility (CSR) and related paradigms, including environmental responsibility, corporate sustainability and responsibility, creating shared value, strategic CSR, stakeholder engagement, corporate citizenship, business ethics and corporate governance, among others. It is primarily intended for advanced undergraduate and / or graduate students. Moreover, it is highly relevant for future entrepreneurs, small business owners, non-profit organisations and charitable foundations, as it addresses the core aspects of contemporary strategies, public policies and practices. It also features case studies on international policies and principles, exploring corporate businesses’ environmental, social and governance reporting. The University of Malta’s promising academic, Dr Mark Anthony CAMILLERI lectures in an international masters programme run by the University of Malta in collaboration with King’s College, University of London. Mark specialises in strategic management, marketing, research and evaluation. He successfully finalised his PhD (Management) in three years time at the University of Edinburgh in Scotland – where he was also nominated for his “Excellence in Teaching”. During the past years, Mark taught business subjects at under-graduate, vocational and post-graduate levels in Hong Kong, Malta and the UK. Dr Camilleri has published his research in reputable peer-reviewed journals. He is a member on the editorial board of Springer’s International Journal of Corporate Social Responsibility and Inderscience’s International Journal of Responsible Management in Emerging Economies. He is a frequent speaker and reviewer at the American Marketing Association’s (AMA) Marketing & Public Policy conference, in the Academy of International Business (AIB) and in the Academy of Management’s (AoM) annual gatherings. Mark is also a member of the academic advisory committee in the Global Corporate Governance Institute (USA). Dr Camilleri’s first book, entitled; “Creating Shared Value through Strategic CSR in Tourism” (2013) was published in Germany. 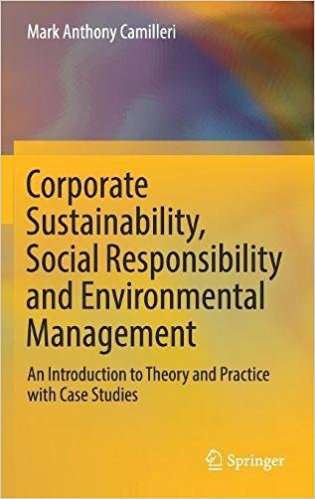 This year Springer will publish his latest book; “Corporate Sustainability, Social Responsibility and Environmental Management: An Introduction to Theory and Practice with Case Studies” (2017). Moreover, he edited a U.S. publication, entitled; “CSR 2.0 and the New Era of Corporate Citizenship” (2017). His short contributions are often featured in popular media outlets such as the Times of Malta, Business2Community, Social Media Today, Triple Pundit, CSRwire and the Shared Value Initiative. Mark’s professional experience spans from project management, strategic management, business planning (including market research), management information systems (MIS), customer relationship and database marketing to public relations, marketing communications, branding and reputation management (using both conventional tools and digital marketing).